In audio transcription, time stamping refers to aligning the transcript’s texts to therecording by inserting timestamps at specific intervals. It is usually an add-on service designed to add value to transcripts, particularly to various types of market research transcriptions. The beauty of timestamps allows readers to effortlessly identify which part of the audio corresponds to which specific segment of texts, making it easy to playback specific parts as needed. Many find this most helpful in market research interviews and focus group transcriptions since responses are easily verifiable and attributable in a recorded interview. It is a very flexible tool for general transcriptions since timestamp intervals are customizable based on the purpose of the transcript and other client personalization requests. 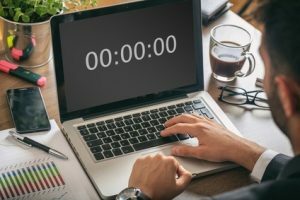 As an example, TranscriptionWing’s standard format for timestamps is [HH:MM:SS] – that is the accurate hours, minutes, down to seconds – placed in different ways within the transcript. Start/End – Some recordings do not start with dialogues right away. Clients identify them by requesting timestamps at the beginning and the very end of the actual interview or conversation. This also works when a client only wants a specific part of the discussion transcribed. Interviewer: [00:05:05] Hi, how are you? Periodic – Timestamps are strictly placed in specific time intervals requested by the client (i.e. every 30 seconds, 1 minute, 5 minutes, 30 minutes, and so on). Interviewer: Hi, everyone. Thanks for joining me today despite the early call time. We really appreciate everybody coming in on time. [00:00:15] Before we start, let me just remind you the ground rules of our conversation today. Please turn off all your mobile phones or turn it to silent mode to remove any distractions during the [00:00:30] discussion. Second, please speak one at a time. Do not talk over each other so I don’t miss any opinion, and so that everything is clearly audio recorded. Also, avoid having your own little meetings. Please always share your thoughts [00:00:45] to the whole group. Speaker Change – A timestamp is placed at the beginning of the dialogue every time the speaker changes. Interviewer: [00:12:52] Okay. When do you think you’ll need it again? Sentence – This is the least requested timestamp format since it can be too much visually. But if a client is looking for a very granular marker, they can opt to have timestamps at the start of every sentence. Custom – Timestamps can be customized for clients who provide special instructions to ensure transcripts are maximized. An example of custom time stamping is when a client requests for per minute timestamps but on the respondent’s dialogue only. Timestamps are at arm’s reach at a low transcription price of $0.50 per minute! Let us know what we can do by calling us at +1-203-413-2414 or by leaving us an email at transcripts@civi.com.